In Saxon regions in the eastern parts of the Netherlands, among which, of course, are the Achterhoek and Winterswijk, many family names usually have the following characteristics: they end in ‘-ing’ or ‘-ink’ ; names derived from place names are preceded by te, ten or ter; many of them are specified by the adjectives ‘groot’ or ‘klein’, ‘lutje’ or ‘lutke’, ‘oud’ and ‘old’, in contrast to ‘nij’ and ‘nie’. Examples in the neighbourhood of Winterswijk are: Groot Kormelink, Groot Landeweer, Groot Nibbelink, Klein Nibbelink, Klein Poelhuis, Klein Langenhorst, Lutjenkossink and Lutke Schipholt. We also come across, Oude Heuvel, Oude Nijhuis, Olde Kalter, Nije Twilhaar, Nijweide, Nieuw Beusink. We sometimes even see two adjectives in conjunction, like Olde Nije Wheme, and Olde Grote Bevelsborg. A second characteristic of the eastern Dutch family name is the large number of which has “huis” (“house”) for a second element. Also in Winterswijk one comes across names like Nijenhuis, Nijhuis, Groothuis, Berghuis, Kamphuis, Lohuis, Nienhuis, Rothuis, Slijkhuis and Veldhuis. A third characteristic is when the family name has been composed from a geographical term with a personal name for a second component: Broekroelofs, Dinkelharbert, Schopbarteld, Schuurhannes, Zandjans. One of the most striking characteristics however is the suffix ‘-ing’, of which the suffix “-ink” is a variant caused by speech; it’s a sharpening of the final consonant. In old documents this variant is represented by spelling it “-inc” or “-inch”. Nowadays we see it occasionally spelled “-ingk”, like in Alberdingk, Odingk en Smedingk. This suffix dating from early Germanic times had for its main meaning: “belonging to”, but it can also be explained as “son of”, and it is especially in this meaning that we find it attached to Christian names. The suffix was not restricted to the eastern parts of the Netherlands but occurred in the whole of the German linguistic area, especially in the Old Saxon and Anglo-Saxon part. Gradually the meaning of “son of” changed into “descended from” or “belonging to the family or the retinue of” and was affixed to the name of an influential man. Thus names of royal families sprang into being like Merovingians and Carolingians, the latter being descended from Charlemagne. In the eighth century we also see Christian names ending in “-ing”: Ameling, Erming, Harding, Huging, Ruding, Willing. At present some still survive, like Azing, Dunning, Haring and Nanning. In the small communities of those days one name was sufficient, but later people needed a first name and a family name. The first example in East Holland is Heinricus Emmikinc, mentioned in Hummelo in 1200, son of Emmiko. When in those ancient times someone called Willing settled as a farmer, his house and the grounds he farmed were named after him, and in this way it became the name of a farmstead, belonging in the category of place-names. Albert te Selle[4. Albert te Selle died relatively recently, after this article was originally published. ] lives on an old farm called “Fökkink” in Kotten. Probably this old farmhouse had a first inhabitant called Fökkink, which means “son of Fokke or son of Foke”. That the meaning “son of” was kept alive for a long time appears from a mention of someone from Ootmarsum called Egbert Tackensoen (son of Tack) but by 1337 and later Egbert Tackinc. He has clearly been called after his father. But for almost all names ending in “-ing” or in “-ink”, it must be assumed that originally these were names of farmsteads, which implies that someone called “Fökkink” almost certainly wasn’t descended from an ancestor called Fokke, but from a farmstead called “Fökkink”. In our family tree we find large numbers of “-ink” names: Willink, Zegelink, Aarnink, Bennink, Besselink, Boeijink, Harmelink, Hesselink, Kruisselbrink, Obbink, Stemerdink, Wassink, Willink, Wilterdink and Zegelink. What now is the proper meaning of the ending “-ink”? Winterswijk has such a big number names of farmsteads and family names ending on “-ink”, that almost the complete alphabet is represented, from Aarnink to Zieverdink (also known as Sieverdink). Even now many people assert that this ending means “son of” as most of the time this ending stands behind an ancient first name. To stick to the name of Aarnink, this name came into being from Arend-ink, so clearly out of a Christian name. But this is not the case in the names Schurink (hamlet Meddo) and Winkelhorstink (Aalten). Here we clearly have to deal with a building (barn) and a piece of land (corner of high land). In connection with this we are very blessed in Winterswijk with the fact that about our farmstead names exceptional many mediaeval data are available in archives scattered here and there. From these archives we can rather precisely gather what the ending “-ink” originally meant here. In this case it turns out that people here in the middle ages still walked around without “-ink” behind their names. Clearly, adding “-ink” to these names originates the farmstead names Hoykink (nowadays Huitink), Hesselink, Hijink, Beusink en Mensink. This is completely in agreement with the well-known Heberolle of the monastery of Frekkenhorst, district Warendorf, from about 950, in which the owners of the tax-giving farmsteads are also only mentioned by their Christian names or name by which someone is generally known. It is true that we see there the ending “-ing” in the names of villages, such as Livoreding-thorpa, Boing-thorpa en Huninghova. So the persons were not and the villages were indeed designated with “-ing”. Are there still more than these 29? Where in The Netherlands or Germany can this name jewel be equaled? The forming of the ending in ” ink” is almost still alive here! How is that, you may wonder? The answer can be found in some archaic name forms as Gorkengoet (1532), (nowadays Geurkink), Eesen-brink (now Eesinkbrink), Beuzen-es (identical with the name Beusink) and Scholten-enk. Just as in the discussed names Bovenhuis (beside Boefkinck), Rosenhuis (beside Roessink) en Luikenhuis (beside Loykink) we have to deal here with the strong genetive declension (on ” en”) of proper names, which changed later on into ” ink”. So the meaning was in fact “from” and nothing else! When a farmstead changed hands it could be identified by the name of the old or the new owner. In 1645 Johan Hissinck lived near Zelhem on farmstead Roessink; in 1660 his sons were called Herman and Lubbert Roessinck but their father was still called Johan Hissinck after Roessinck. Thus the ancestors of our Te Selle family were first called Wiggers, a name that still frequently occurs in the municipality of Winterswijk. As soon as they became inhabitants of the farmstead “De Selle” they are called “Selleman” or “Te Selle”. The introduction by Napoleon of the obligatory enlisting for the army – the conscription – changed the giving of names. The inhabitants of Holland who did not bear a family name yet were ordered by Napoleon’s decree of August 18, 1811 to adopt one within the period of one year. And thus, fixed hereditary family names became obligatory. After the introduction of the Registry Office (of Births, Deaths and Marriages) , everybody had to choose a name and quite a few people didn’t know exactly what their name was. In those cases, both names were entered. Because of that method, we find double names like Geerding Johannink, Vennegoor or Hesselink, Wissink and Geerdink. Te Riet also called Scholten. It was also possible to translate “or” into the more posh Latin “sive”, and thus names like Ter Haar sive Droste, Rengelink sive Röttgers sprang into being. People with the same name could be distinguished by adding “on” followed by the name of the farmstead: Ensink on Kemna; Ensink on Reimer. Gerrit Willem Bloemers who emigrated to America in 1842 with Janna te Selle was given the name of “Dijksbos” at baptism, the name of the farm (Diekebos) where he was born. When permanent family names were introduced he called himself Bloemers (again) after his father. The family names derived from place names (in East-Holland all names of farmsteads belong to this category) may or may not be preceded by a preposition, with or without an article, or they can be linked with ‘man’. So one can either be called ‘Te Selle” or “Selleman“. If one lived near a brooklet, dike, a region of high land, or field in West-Holland, one is called Van (der) Beek, van Dijk, Dijkman, van der Horst, van der Velde, or in het Veld; in East-Holland, however, one was called ter Beke, Beekman, ten Dieke, Diekman, ter Horst, Horstman or te(n) Velde, Veldman. The latter two prepositions have been contracted from ‘to’ and the declined articles ‘dem’ and ‘der’. In some family names that still exist, the old forms have been kept: to Bokholt, te(n) Bokkel, Thorbecke (ter Beke), Thomberg (ten Berg), Tombrink (ten Brink); Tombroek (ten Broeke). Various Te Selle’s married a Bosch or a Toebes. Because the stress is usually placed on the first syllable, names are difficult to recognize at times. 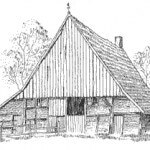 We sometimes find both the West- and East-Holland way of composing the same name indiscriminately: te Lintelo, called after the farmstead to Lintelo, besides van Lintel. In the first case, the East-Holland ‘te’ has been combined with the full name of the farmstead; in the second, the West-Holland ‘van’, with the local pronunciation form of Lintel. So for the East-Holland names with the prefixes ‘ten’, ‘ter’ and ‘te’ are characteristic. Te Beest, Te Bokkel, Te Bogt, Te Braake, Te Brinke, Te Brummelstroete, Te Kolsté, Te Giffel, Te Winkel, Te Gronde, Te Grootenhuis, Te Hennepe, Te Hofstee, Te Koppele, Te Kortschot, Te Kronnie, Te Kulve, Te Lindert, Te Lintum, Te Loo, Te Luke, Te Mebel, Te Molder, Te Morsche, Te Pas, Te Paske, Te Peele, Te Plate, Te Poele, Te Riet, Te Roele, Te Roller, Te Selle, Te Siepe, Te Slippe, Te Strake, Te Vaarwerk, Te Veele, Te Voortwis, Te Vruchte and Te Winkel. The De Selle Farmstead – From where does the name originate? Many farms derive their names from particular situations, such as soil condition or local. From where, then, does the name of the farm De Selle originate? It is generally accepted that sele-names belonged to the West Germanic tribes of the Chamaves and Salians who originally inhabited the territory on the right bank of the Rhine. The name of Hamaland occurred by the tenth century, so the occupied territory of the Chamaves or Salians might possibly have been between the IJssel and the Lippe rivers also known as Salland, the Gelderland Achterhoek, and West-Overijssel. The collection of tribes in this area formed an alliance called the Cheruscs or Cherusci in order to protect against Roman advances. Whereas the tribes paid tax to the Romans in the form of cow hides and supplied soldiers for the Roman army, the Chatuari, the Bructer, the Amsivari, and the Chatti tribes grouped together as early as the third century to present a powerful and united front against the northern most advancements of the Roman Empire. After the third century, this alliance was designated with the generic term Salian Franks (Franci Salii). The name Franks means “brave” or “bold” and was used by warring tribes to describe themselves. Since the Franks were adventurers and united in order to attack the lower Rhine boundary of the Roman Empire, this name is probable. The military power of the Franks developed quickly during the second half of the third century. Together with the Alamanni and other Germanic tribes, they invaded the Roman Empire between 250 and 275 C. E. and successfully attained what was known as Gaul by 274-275. After the collapse of the Roman Empire, the Franks settled in the now southern part of the Netherlands and the northern part of Belgium. There are quite a few place names in which the word sele is found, such as Broeksele (Brussels), Barsele (Basel), Melsele, Belsele, Elversele, Moorsel. These place names are composed of two Germanic words: Bara which means barren, bare, or desolate which can be seen today in the term “bare feet” and Sali which can also be written as sela, sele, and selle. In the year 1156, the village of Bazel, Belgium was called Barsela. By the thirteenth century, the place names could also be written as Barsele or Baessele. Analyzing the compound word, then, a person can deduce that bara + seli easily indicate the condition of the soil upon which the house was standing so that the explanation of Barsele would be a house being made up of one room and built upon arid or barren land. Broek, however, means a pasture of alluvial soil along a stream. Consequently broek would mean the best meadowland where farmers put their cattle out to pasture. The name Brussels first came into being as “broek-seele”. Sele or zaal is a building in the broek or meadowland. With this same reasoning, a person can also interpret the family name van Moorsel with mor which means bog or swamp land and sele again meaning house. To conclude, it can be mentioned that not only does Winterswijk have a farm by the name of De Selle but there is also a village, Ellecom, which has a farm named De Selle known since the eighteenth century as Hofstede in De Selle (Farmstead in De Selle). The name Te Selle, how is it written? In Dutch-speaking countries (and derivations of it), languages, places, some ideas/notions /concepts and proper names get a capital (letter): Northern-Holland, German, Winterswijk, Second World War, Jan van den Berg. Also the preposition of a name, like in Te Selle, is written with a capital letter when the name is not preceded by an initial (letter) or a first/Christian name. Family name and its preposition also have to be kept together on one line. A space is placed between the preposition of a family name and the proper family name. In the plural form the letter ‘s’ has to be connected to the preceding word if the pronunciation of the word is not changed by doing so. Harmen Jan te Selle emigrates to America. H.J. te Selle emigrates to America. Mister Te Selle emigrates to America (note: given name or initials are not shown). The Te Selle brothers emigrate to America. The Te Selles emigrate to America. The present Te Selles in the United States most of the time leave out the space between the preposition and the family name (i.e., TeSelle). Nevertheless, the capital (letter) ‘S’ often remained, as in Harmen Jan TeSelle. About what can we be fairly certain? The farmstead names ‘De Selle’ and ‘Wiggers’ are very old and are already mentioned in the land tax list of 1648. Both farmsteads are situated in the hamlet Woold belonging to the municipality of Winterswijk. The people living at farmstead ‘De Selle’ were called Te Selle and the people at ‘Wiggers’ were called Wiggers after the name of their farm. About 1712 Harmen Wiggers begins to inhabit farmstead ‘De Selle’ and since then he is called Harmen te Selle. From that moment on his children too are called Te Selle. People living at the farmstead ‘De Selle’ before 1700 were at that point also called Te Selle yet later received other family names. Up until now they are not demonstrably related to the present Te Selles. In the period that The Netherlands were annexed by Napoleon (1810-1813) and formed a part of the French empire, the name Te Selle became an official family name with the introduction of civil registration. The family name Te Selle is derived from the name of their farm. The word Selle is derived from the language of the West-Germanic tribes. Sali, their word for a dwelling, evolved in the course of time to sela, sele and selle and meant “housing for man and cattle being made up of one room”. The family name Te Selle is typical of Achterhoek and even typical of Winterswijk. Nowhere in The Netherlands or America have we so far come across people carrying the Te Selle family name that cannot be traced back to our family tree.